Papa Legba is the gate keeper, the one that guards the Poto Mitan and who opens the pathways of communication between humanity and the Lwa. Without Papa Legba no Lwa may come from Ginen to mount their horse in the peristyle, no Lwa may send their blessings, no Lwa can hear our call. Nor can we receive from the Lwa without the assistance of Papa Legba and so we need to honour him before all of the other Lwa. 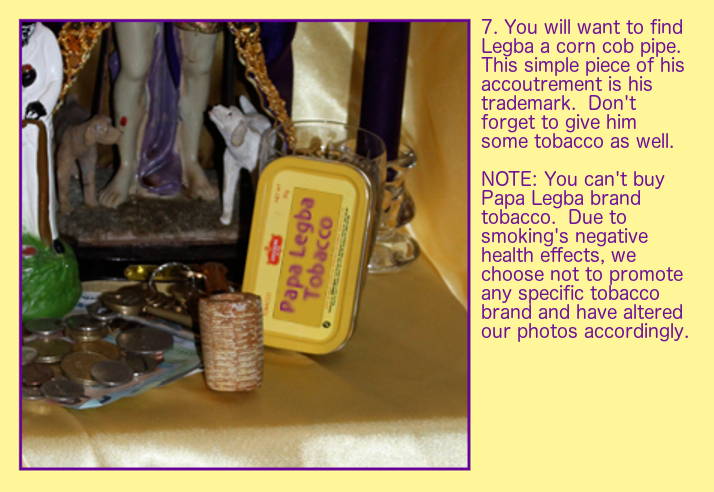 Legba is the force of communication, it is through Legba that we are able to effectively communicate with each other. 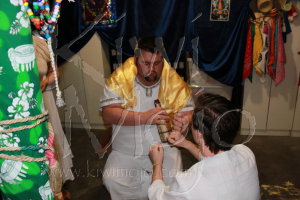 Every single person in the world has a Legba that journeys with them and opens the way between them and the spirits and so it is fitting that we should honour him before all other Lwa and we should honour him before making any service or fet (meaning party) to any Lwa. Legba is known by many names, although the most common are Vye Legba (meaning Old Legba, a reference to his great age as he was made first by God) and Legba Atibon, but for the most part he is called Papa Legba. We affectionately acknowledge him as a father to all of us who rely on him so heavily to bring that which we seek into manifestation. 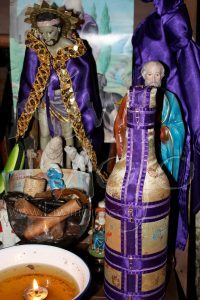 Although every day belongs to Legba He is most commonly served on Thursday, the day of the Rada Nation, but in reality Legba is served every day. 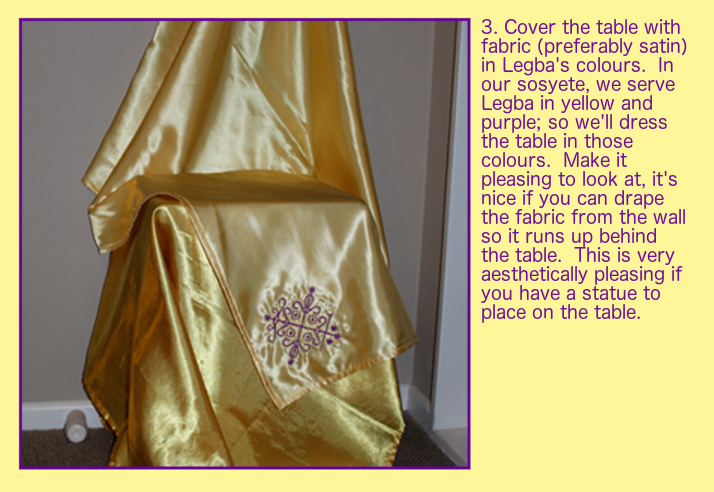 His colours in our house is yellow and purple, He is also commonly served with white and red although the later is more indicative of Legba-nan-Petwo. He also has a cane or stick, crutches, and of course keys with which he can open any gateway. He is associated with St. Lazarus and sometimes in the Petro rites with St. Anthony of Padua or St. Roch. In New Orleans he is also commonly associated with St. Peter who holds the keys to heaven. 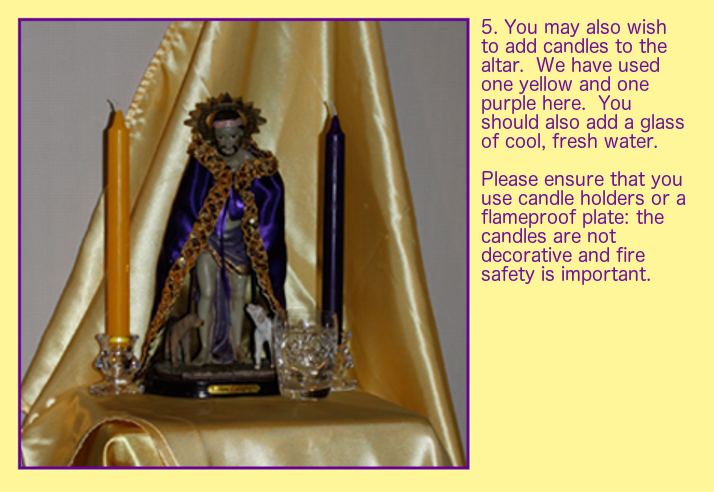 Offerings to Legba are very simple, as Msr. Houngan Max mentions above. Some of the most common are grilled or smoked chicken, goat, sweet potatoes, white yams, bananas, any fresh fruit, black coffee made strong with no sugar and a second cup of coffee made strong and black with lots of sugar, and he likes pipes with tobacco. I often give him a cigar (a nice Cuban one) which he has never neglected. 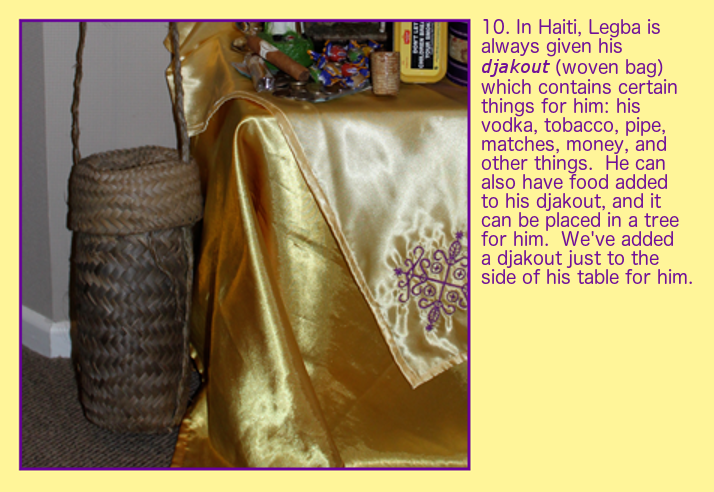 In ‘Ayiti he has a djakout, a straw woven bag which contains his pipe and tobacco and a bottle of rum and He is often presented with this when He comes in possession He is also given roosters, smoked fish, cassava, candy, guava, white and red beans and rice. 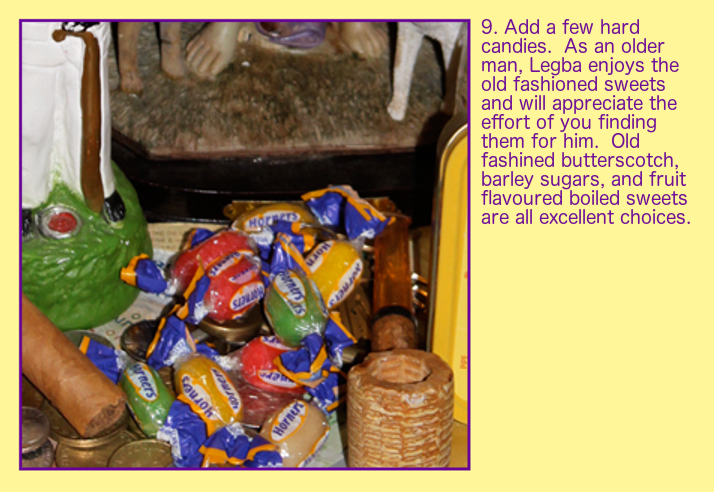 Beans are made for him from these ingredients and placed on his altar or on the floor. 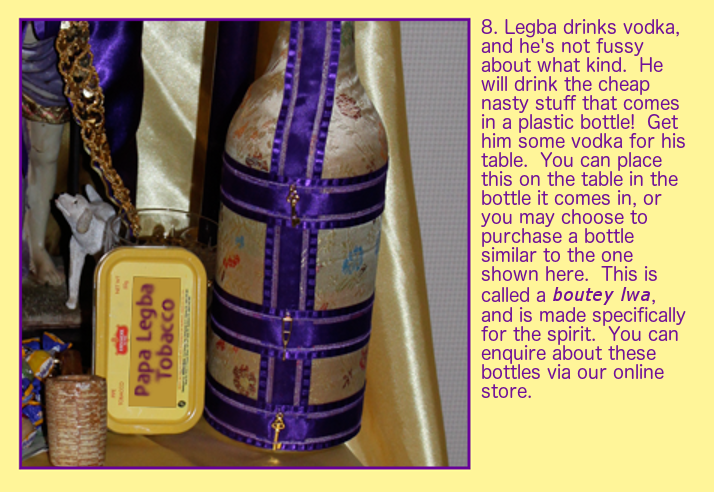 We serve Him vodka to drink along with his coffee and sometimes He enjoys a beer as well! When we serve Legba in Petwo rites his foods are similar, but as a younger Legba we serve him rum which has been peppered, and we prepare his foods with tabasco sauce and cayenne peppers. 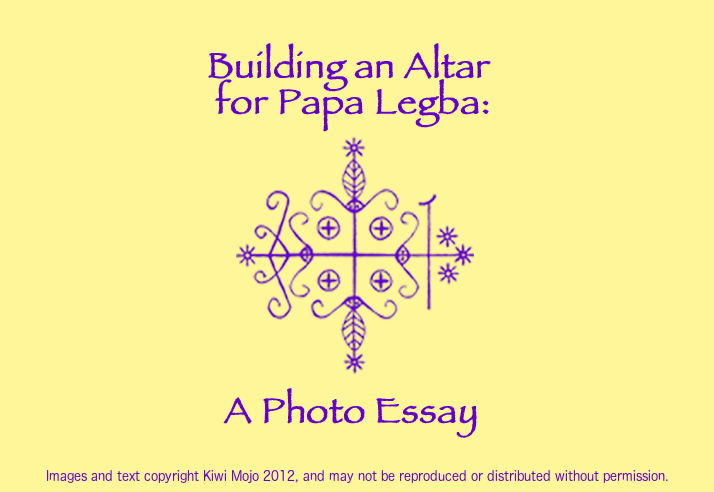 There are more Lebga than most people realise, as Legba comes in every nation of the Lwa. 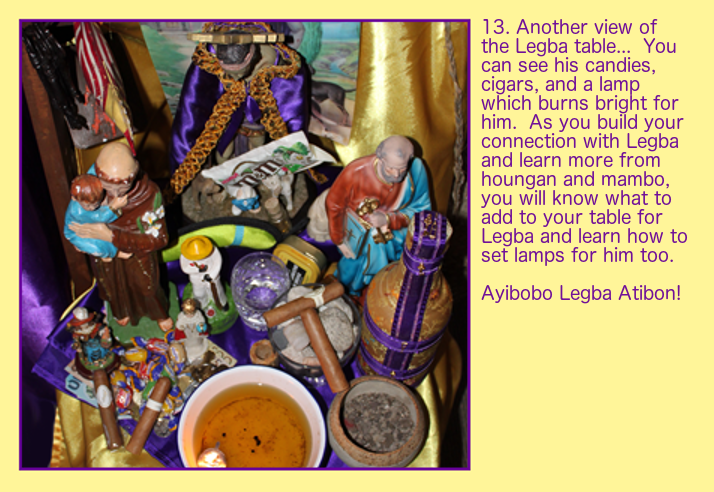 We call on Legba in Rada, Nago, and Petro and and at certain points in between, and each one of these Legba controls all within his realm. It is through him that the door to each group of Lwa is opened. In all of his guises, he is the one that opens the doors between the visible and the invisible, he can stop of remove and obstacles in our path, or that prevent the arrival of the other Lwa. 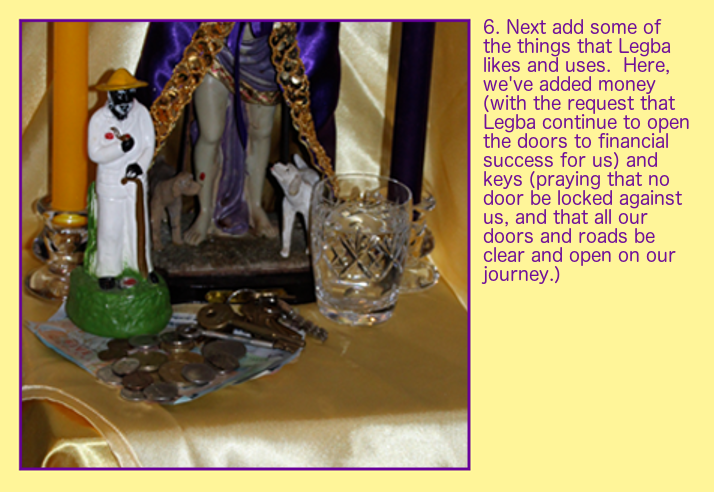 Legba opens the door to opportunities and is the fulfillment of those opportunities. There is no Lwa like him, and he is served by all that serve the Lwa. 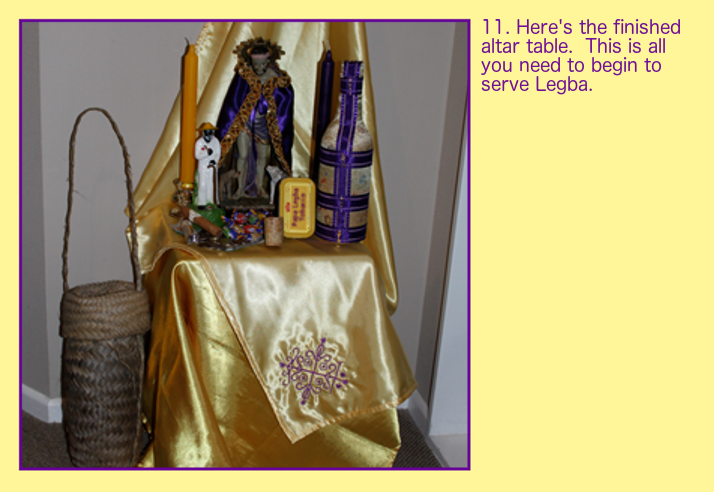 An altar to Legba is kept separate from the table that is kept for all the other Spirits. 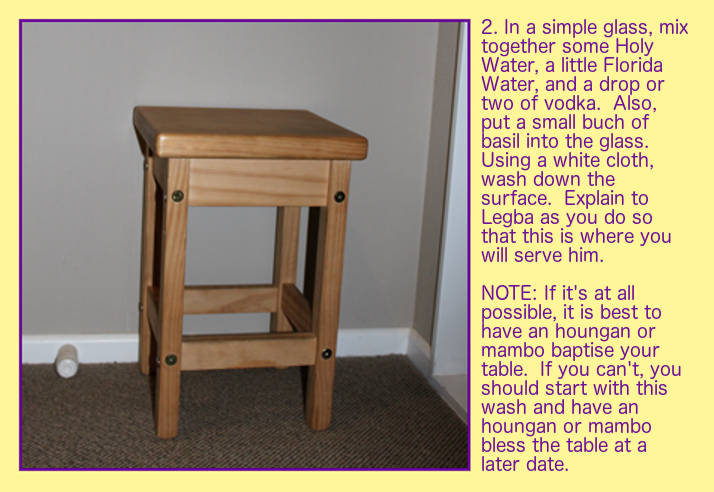 His table is usually kept near the entrance to the home or the entrance to the temple. 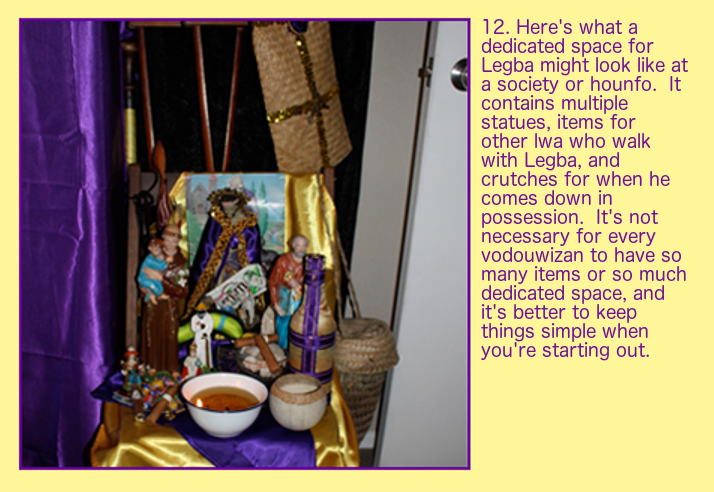 Every Vodouisant has a relationship with Legba, and getting to know him, and making service to him is not difficult. The first thing I recommend is learning at least one of his sacred songs. While you are learning a song for him, you can start to put together an altar near a doorway where you can honour him, serve him, talk to him and make offerings to him. 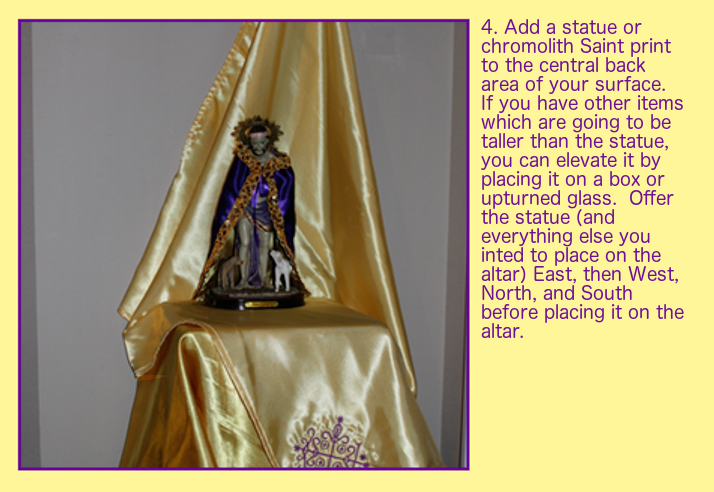 We’ve created a tutorial on how to build your own altar to Papa Legba. 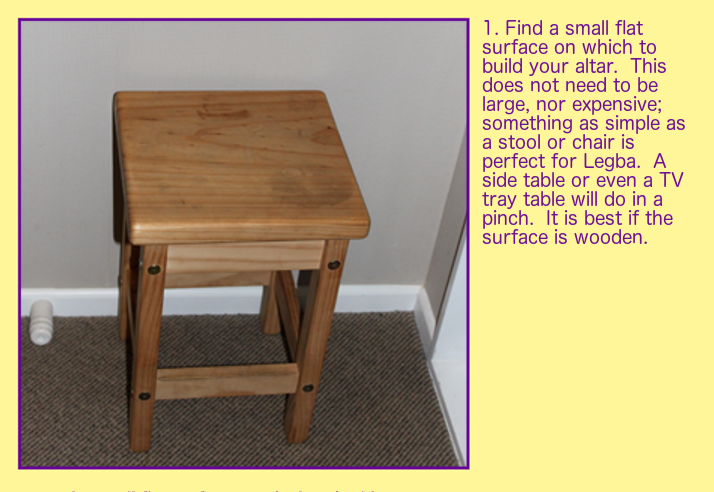 Either follow along using the gallery below, or use the downloadable version here.